During the last five years, the organization has grown multi-fold from 2 million transactions a day to 20 million transactions now. 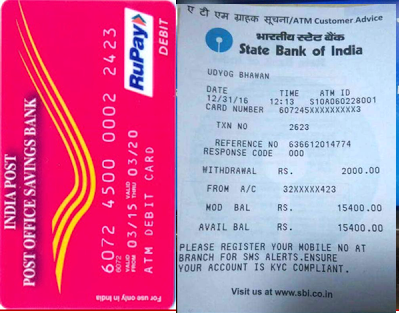 From a single service of switching of inter-bank ATM transactions, the range of services has grown to Cheque Clearing, Immediate Payments Service (24x7x365), Automated Clearing House, Electronic Benefit Transfer and a domestic card payment network named RuPay to provide an alternative to international card schemes. As on end-October 2015 over 220 Million Indians own RuPay cards. 31.12.2016 onward POSB Debit Card Holder can withdraw money from any Bank ATM and the same, Any Bank Debit Card Holder can also use India Post ATM. It is major step taken by Government to utilize DOP ATM now a days of Demonetization. The India Post has 1000 working ATM across the country and it can play a big role to reduce burden on Bank ATM.